Hotel Eufória*** is located in the village with the most beautiful view of the Tatras - Nová Lesná, about 6 km from the town of Poprad. It offers comfortable accommodation in double rooms, triple rooms, family rooms and for those more demanding in the apartment. There is also barrier-free accommodation for immobile guests. The hotel has a restaurant and a bar with beautiful panoramic views of the High Tatras and excellent home cooking, which has already received a lot of praise and positive feedback from our guests. After all-day tours and excursions to the fresh Tatra air, our guests will be delighted by the jacuzzi and sauna. For those more active, the hotel also offers a fitness center, tennis court, table tennis and billiards. The hotel is also suitable for families with children. Hotel is pet friendly! The capacity of the hotel is 80 beds. Stylish apartment has a large living area with leather sofa bed, TV, Hi-Fi system and Wifi. A separate bedroom with a double bed gives parents a pleasant privacy after a day-long trip to Tatier with their families. The apartment has a separate toilet and a bathroom. The bathroom is equipped with a large hydromassage bath with radio. An electric kettle is always available in the apartment for coffee, tea and mineral water. Double room (1 double bed or 2 single beds) with private bathroom with a shower or hydromassage bath, TV and WiFi. Double room (1 double bed or 2 single beds) with one extra bed in the form of a pull-out chair. The extra bed is suitable for children up to the age of 12. Room features a private bathroom with a shower or hydromassage bath, TV and WiFi. Large, spacious family room with 1 double bed, 1 single bed and and a larger pull-out couch for two more people. The room has a larger bathroom with toilet, TV and WiFi. Large, spacious family room with 1 double bed and 1 single bed. The room has a larger bathroom with toilet, TV and WiFI. Spacious room with a double bed and a sofa bed. The room has barrier-free access, barrier-free bathroom and toilet, TV and WiFI. 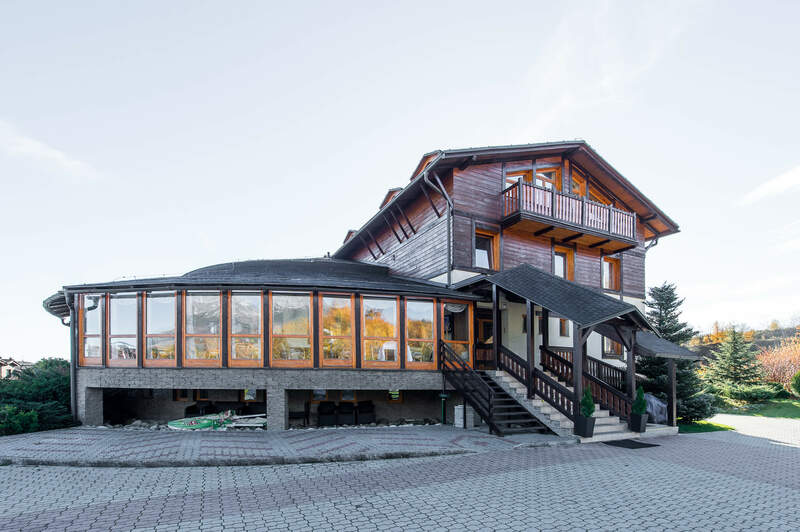 Hotel Eufória has a stylish arched restaurant overlooking the High Tatras panorama. Meals are provided in the form of rich buffet tables. Our customers most often choose half-board accommodation. A la carte menu is also available throughout the day at the hotel's restaurant. On request we can always prepare meals for guests with lactose intolerance, gluten etc. Panoramic winter garden overlooking the High Tatras. Reception services are available throughout the day. After every walk in the fresh air or skiing on the slopes of the High Tatras you can enjoy the relaxed relaxation in the whirlpool and sauna. Tennis court with a beautiful view of the High Tatras with the possibility to rent a rocket. There is a 24-hour fitness center. We can arrange transfer from the airport, transport for excursions in the Tatras and surroundings. During the winter season, the ski bus takes you to the ski resorts. This hotel is in the amazing location very close to Tatra mountains. You can get there by train. The staff was helpful and the meal was fine. The accomodation which we had was very comfortable - we weren't accomodate in hotel, but in appartment close to it. The price for all was reasonable. We were here for 4 nights and we were satisfied, so I can recommend. + Amazing mountain-vew from the restaurant at the breakfast. Scrambled eggs without any meat (finally after situation in the Polland :)) ) Rich breakfast, hot dishes are widely represented. Very quiet, easy to find. Reception working 24h Stuff understand Russian.